It is an old machine. There is a needle dial on front for indicating the speeds. From looking at the catalogs it seems to predate the 1950's models. I do not know if it works or not. However there are metal filings on the table, so it must have been at least working recently. It says, Rockwell Manufacturing Co., Power Tool Division, Single-Phase Motor, 1725 RPM, Model 82-910, 115/230 volts. 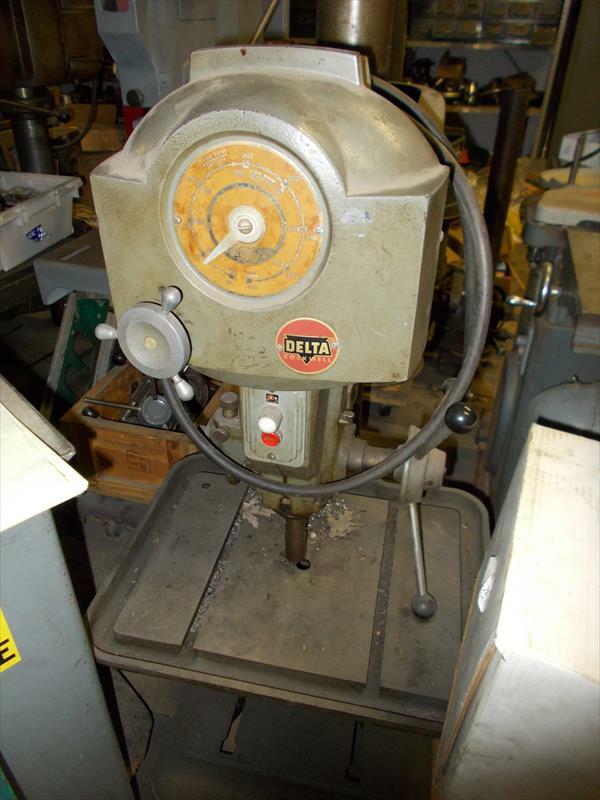 There is a catalog number 17-600, suggesting that this is a 17" drill press. It is a floor model with a height of around 71 inches. The table measures around 20 1/2 X 16 inches. From the exterior, it looks intact and is dusty, not rusty. The top cover is missing, however it is possible it is laying around the place (there are a few that I can see high up on a shelf). If someone is truly interested we are willing to try and match a cover up. We are happy to arrange a visit for a potential buyer to see if this machine is right for them but it will be pickup only. Cash preferred, please contact me or my husband to arrange any payment. Thanks! This belonged to my husband's late father and has not been run for several years. It has been stored in a storage building out of the rain. I can not move it myself but we do have a Kubota forklift to help lift it out of the building. Plus it is already on a rolling cart to help get it to the loading door. Pickup only please!